Pitagora is an advanced programming software with a 3D graphic simulator, developed by Paolino Bacci to control from 5 up to 13-axis CNC machining centers. No other softwares are comparable with Pitagora! Discover the unique features of Pitagora! What makes PITAGORA unique is the exclusive MSP (Machine Status Prediction) function used to generate NC programs. MSP is a complex system that ensures the tight integration between control software and machining center and allows eliminating stand-by time, decelerations and synchronizations. This is not just an ordinary “cycle accelerator” or an off-workpiece trajectory optimization function, like those available with most generic programming systems. This unique function truly eliminates all possible kinds of “stop & go” conditions during machine movements, both off-workpiece and while machining, thereby significantly reducing the production time. The video shows an example of program made with Pitagora (on the left) and with a commercial CAD/CAM software (on the right) demostrating the benefits that you have in terms of saving in cycle time and therefore increasing the productivity of the machine. *Moreover, in addition to the tangible and immediate optimization of off-workpiece trajectories, Pitagora also eliminates all “stop and go” conditions during all machine movements, thereby significantly cutting production time. This allows a considerable reduction of production times of up to 50% compared to the programming performed with conventional CAD / CAM programming systems. 3D SIMULATION: no more errors! 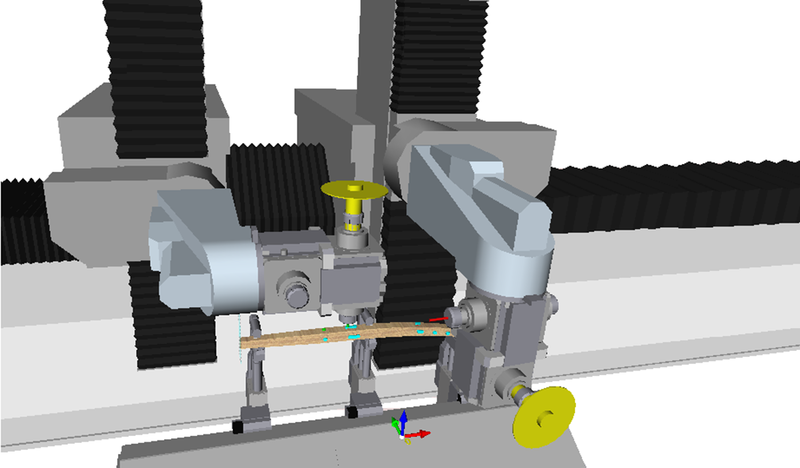 The 3D simulation includes all main machine elements: the machine itself, its clamping devices, the reference models. Correct programming is verified by means of a 3D simulation of all machine movements and an effective display of all tool paths involved in the machining process. These features ensure complete advance control of all collision risks. Pitagora is equipped with its own rationalized and complete series of CAD tools to program 4 and 5 axis machining and may also be interfaced with the most commonly used CAD/CAM systems, directly importing machining programs, 3D models of pieces, tools and clamps. In this way, old piece programs may be reused and optimized, thus fulfilling the Pitagora advantage in terms of reduced cycle time. Thanks to the intuitive, user-friendly interface, the main software features may be learned easily and quickly by programmers. Programming time may be cut by up to 80%*, and the cycle is automatically optimized! *Comparative studies have shown that a programmer, even a non-expert, can produce a piece-program using Pitagora in less than 15 minutes; with competitor software the program generation process takes well over 90 minutes, and nonetheless not achieving the same level of optimization that is automatically achieved with Pitagora. EASY PARAMETRIC PROGRAMMING to create bores, mortises, tenons, FingerJoints - MMO Modular Machining Operation. SHORT CONNECTIONS FUNCTION, allowing for the automatic identification of the best possible tool movements in terms of the time required between one operation and the next, thereby avoiding possible collisions; this function automatically updates the joints when the MMO-type machining operations vary. TOOL MANAGEMENT LIBRARY built-into the software, to allow using any type of tool. COHERENT CLAMP POSITION function that automatically positions the clamps based on the piece and how it is positioned on the machine. COHERENT FEEDER POSITION function that positions the hopperfeeder magazines based on the piece to be machined and how it is positioned on the machine. AUTOMIRRORING function that automatically mirrors and programs right and left pieces. ISO IMPORT that allows using CN programs generated by other CADCAM tools available on the market. NEW PARAMETRIC PROGRAMMING for doors and windows frames (and not only), which may be integrated with the list of customer orders (by means of a CSV file), to automatically generate the part program for each element (bar code also available). 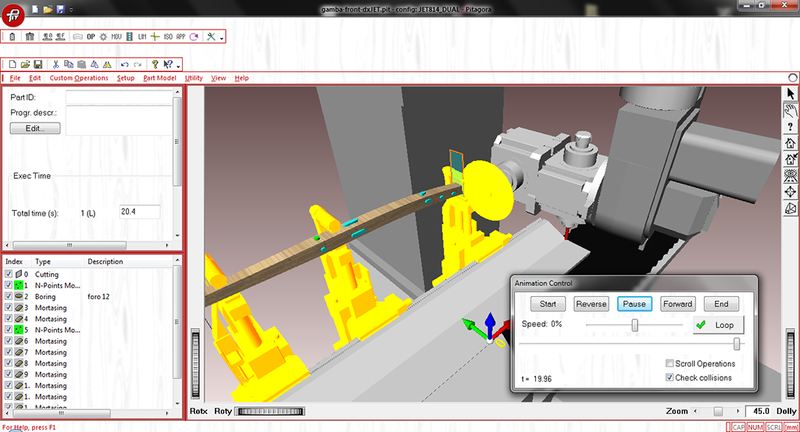 The machine setup is also parametric.